More and more businesses are discovering that marketing for your website is one of the essential things you can do for the success of your business. Searching for goods and services on the internet has become more prevalent and doesn’t look like it’s going to slow down anytime soon. Because of this, it is in the best interest of your plumbing company website to rank in the search engines. There are two possible ways that your website is able to rank higher in the search engines, and this is either with organic SEO or PPC. Both of them have features that are able to benefit your plumbing company website and get you long term results in search engine rankings. Both SEO and PPC Marketing Have Benefits and Are Most Effective When Used Together. At Plumbing Webmasters, we offer both PPC and organic campaigns for our plumbing contractors. We are able to provide both services so your plumbing company gets the success that it deserves. Want to have your plumbing company website rank higher? Call us today at (877) 388-9884 to discuss the options of PPC vs. Organic campaigns for your plumbing company’s website. The short answer is the PPC is paying for advertising for your plumbing company website and organic search refers to ranking your website in the search engines using a number of SEO components. Both are used to increase the effectiveness of your plumbing company website marketing. But while those are the easiest explanations to differentiate the two, there are other factors that separate them entirely. The Cost: We will start with the most obvious, which is the cost. PPC is paid advertising to gain customers and organic is a free way to gain customers. There is an ongoing cost when using PPC. Traffic To Your Website: Customers are more likely to click on organic than PPC, but it takes a while for organic to show up in search rankings. PPC will get you traffic fast and organic gets you long-lasting traffic. Converting Consumers to Customers: With the right keywords, PPC is better at converting consumers into real customers of your plumbing website. Results in Rankings: Organic SEO takes time to fully optimize online, but PPC campaigns start working almost immediately. What Is The Difference Between PPC and Organic? 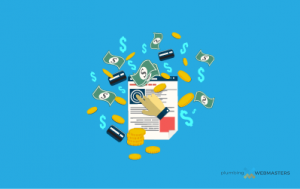 Both PPC and organic have their pros and cons, but both are beneficial tools in order to get your plumbing company website ranking higher, gaining more of a client base, and increasing your sales. 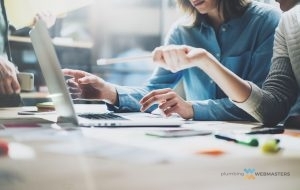 The Plumbing Webmasters are able to use both techniques to ensure your plumbing company website gets the long-lasting results that you want. Call us today at (877) 388-9884 for PPC vs. Organic SEO campaigns for plumbing company websites. We’ve established that both PPC and organic are great for marketing for your plumbing company website. While organic costs less and gets long-term results, it takes a while to optimize online. Although PPC may cost more, it targets your specific audience and area and works instantly. Plumbers don’t have to use PPC for long-term, just until their website optimizes, which is why using PPC and organic to give you greater online visibility is important. PPC Vs. Organic SEO Campaigns for Plumbing Company Websites Can Work Together To Bring You Greater Success. At Plumbing Webmasters, we can take care of your PPC and organic marketing strategies by providing PPC vs. Organic SEO campaigns for plumbing company websites. We will ensure your website gets the results it deserves with both organic SEO and PPC campaigns. Are you ready to have your website ranking higher and gaining more sales leads? Call us today at (877) 388-9884 for PPC vs. Organic SEO campaigns for plumbing company websites. Updated on April 4, 2019 at 8:20 pm by Plumbing Webmasters.